“He does good things. He buys us cool stuff,” says 14-year-old Kris. Drew also has two children by his wife, Stacy: Anthony, 5, and Lacy, 3. “We’ve told Anthony and Lacy that their mom is on vacation. Child care specialists spent time with the kids, and they said that [excuse for Stacy’s disappearance] was very age-appropriate. These specialists all said I have the most well-adjusted kids on the planet,” he says. “Overnight, I went from being a watch commander of an entire town to being a mother of four. I’ve got to tell you the mom job is much harder,” Drew jokes. When the taped segment ends, Dr. Phil faces Drew. “It’s been a year. During that time you really haven’t behaved or conducted yourself the way most people think they would in similar circumstances,” he says. “We definitely looked for her with private investigators, but showing emotion? I’ve been a policeman for 32 years,” Drew says. 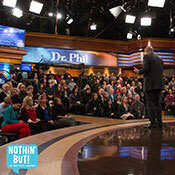 “Do you think she will ever reappear?” Dr. Phil asks. 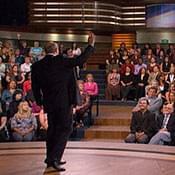 Dr. Phil expresses skepticism that Stacy simply vanished without a trace. 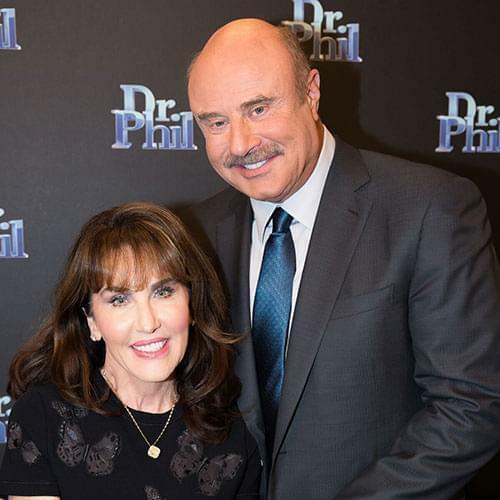 “I think this defies all logic, I think it defies all common sense that she could or would just disappear, which makes me believe that there’s been foul play involved, if not you, then somebody,” Dr. Phil says. “It’s a possibility, but I don’t know,” Drew says. “I am very troubled by these repeated reports [regarding] two of your wives that reportedly said that if they died by accident, then people should look at you,” Dr. Phil says. “I can’t answer for them,” Drew says. “I can’t. I would if I could,” Drew says. Joel shares his final thoughts. “There is no evidence that one could present in a court of law that Drew had any involvement in Kathleen Savio’s death, or had anything to do with Stacy’s disappearance,” he replies. If you have any information regarding Stacy Peterson’s disappearance, contact the Illinois State Police at (815) 726-6377.